Poor mental health is not necessarily the same thing as mental illness. 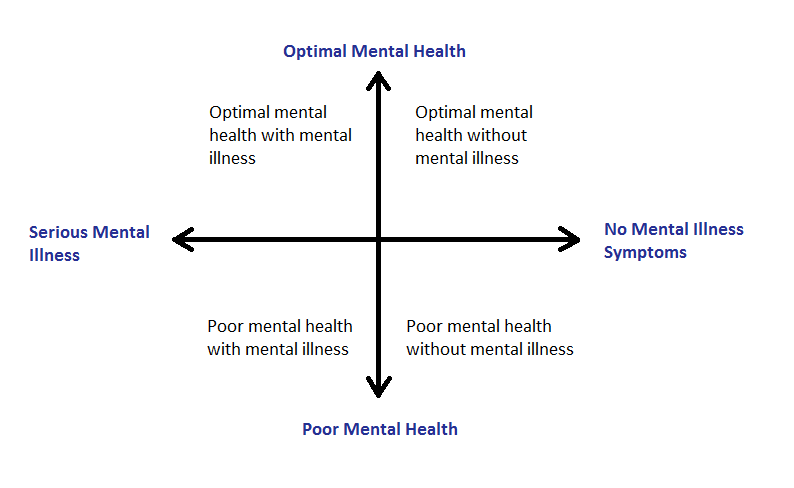 See the mental health continuum grid above. One in five Canadians will have a mental illness in their lifetime. This affects every one of us, whether at work, at home or in the community. Mental illness affects people of all ages, educational and income levels, and culture. Approximately 2.5 million Canadian adults or over 10 per cent of the population aged 18 and older will experience a depressive disorder. On any given week, more than 500,000 Canadians will not go to work because of mental illness. Stigma or discrimination attached to mental illnesses presents a serious barrier, not only to diagnosis and treatment, but also to acceptance in the community. With effective diagnosis, treatment and support, most people can get back to feeling well and being productive.